A double end bag (DE bag), also called a floor to ceiling bag, is a small, circular bag that's connected on both ends by an elastic cord. No one knows who exactly created the double-end bag, but it became popular in the 1950s when Sugar Ray Robinson was seen working it very quickly, with great timing and fluidity. Today's bag is different from his bag and because it's attached to the floor by a rubber cord. This limits its range and movement, and requires fighters to respond faster. It allows fighters to perform punching workouts in different ways; this helps them improve their punching skills. At MMA Life, we have done extensive research and personally tried many double end bags. Below is our review of the best on the market right now. Double end bags are used to improve rhythm, timing and accuracy more than technique. 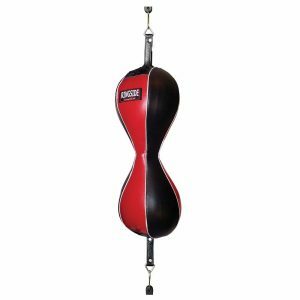 The recoil distance and elastic movement you get from a double end bag makes it ideal for working on the aspects of boxing that you do not get to work quiet as well with a heavy bag or a speed bag. Allow fighters to experiment by throwing any kind of punch. This is especially true for learning how to throw accurate and quick lead hooks. Help fighters improve accuracy when throwing punches on a moving target. Erratic motion helps fighters improve their hand speed. This means that fighters have to use fast and quick punches at constant pace so they can connect cleanly and maintain rhythm. Develops cardiovascular endurance and gets fighters' arms used to throwing multiple punches quickly. It also allows fighters to get used to the feeling of missing punches; this allows them to become smarter with how much energy they use and become more accurate. If you would like just a quick overview of the DE bags in this article, we have made a quick comparison chart for you to use. Cleto Reyes is one of the most distinguished brands in boxing, making competition gloves for some of the biggest names in the sport. As with all their products, this is on the more expensive side. But when you buy Cleto Reyes, you know you are getting a quality product and this double end bag is no different. This teardrop shaped bag is 11 x 7 x 4 in (28 x 17.75 x 10 cm). An order will get you two bladders, so you don't have to worry about wearing out the first one. The laces and seams are made out of tough durable leather, and it is double stitched, ensuring that it will last quite a long time. It is only available in black. The valve is on the side of the double end bag to ensure that you don't accidentally hit it when you punch. Great and responsive bag for working on your jab and hooks. This bag requires two swivels and an elastic band to mount to ceiling and floor, which is sold separately. You have a variety of choices when it comes to size and color of this DE bag. It comes in three sizes, 9 inch (23 cm), 7 inch (18cm), and 6 inch (15.5 cm). It also has three color varieties to choose from: black, gold, and red. This bag is all-leather shell with triple nylon stitching with two o-rings for the hook-and-loop cables, which are included in the purchase. Each of the cables are 3.5 feet (1.06 meters) stretchable bungee cord. Many users agree that this bag is a very durable and high quality bag for this price range and will last for years to come. However, one common complaint is the location of the air valve; it is at the bottom of the bag, between the strap. The location makes it a bit awkward to fill up while the ball is hung up. 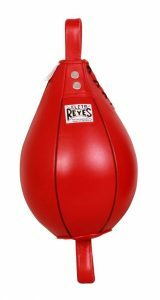 This round-shaped double end bag is a popular one on Amazon and comes in at half the price of the Cleto Reyes and comes with everything you need to set it up. This bag comes in three options, the 9 inch (23 cm ) bag, the 7 inch (18 cm), and the 5 inch (13 cm) bag. If you are a beginner, you should get the 9 inch ball as there is more surface area for you to hit. 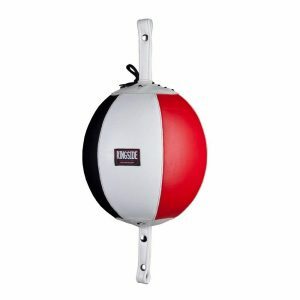 However, many people do progress from the 9 inch ball pretty fast---so if you are athletic and catch on quick, the smaller ball might be the better option for you. 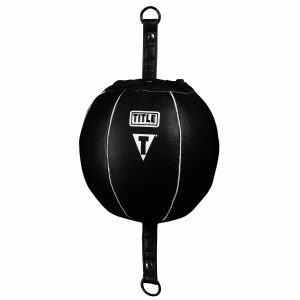 If you have been boxing for awhile, it is suggested that you get the 5 inch ball. One thing that many people have mentioned for this bag is that you may need to refill with air once a month due to the propensity for slow leaks. However, if you don't mind the risk of slow leaks, this is triple-stitched so it can take a lot of abuse. Aside from the standard double end bag, Ringside also makes a Mexican-style double end bag, sometimes called a double-double end bag. Because instead of just one bag to hit, you get two. Mexican double end bags has an upper portion and a lower portion bag to simulate the surface area of a body. This gives you extra options for where to hit. You can go with a high jab to the face or a low jab to the body. Because this bag is a bit bigger, it won't move as much as the standard double end bags unless you change out the default cables to more elastic ones. This bag weighs one pound (0.45 kg) and like many other Ringside products, is excellently constructed with leather. This is another Mexican style double end bag in design but it is bigger/wider. The Ring to Cage one is a bit cheaper at the time of writing this review and comes with free shipping---but it is not Prime eligible. 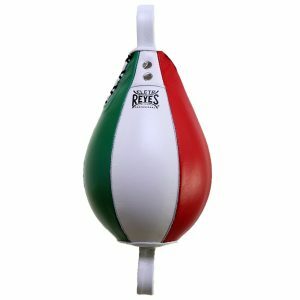 So although you pay a bit less for this bag than the Ringside Mexican style DE bag, you will have to wait longer. Another difference is that this bag does not come with cables to hang while the Ringside one does---and that probably goes into the price calculation. This DE bag comes with everything needed to get started, including the cables and S-hooks. The S-hooks add a little bit more motion to the ball. 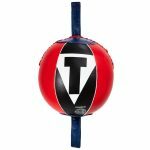 This 6 inch (15.25 cm) diameter round bag is perfect for more advanced boxers as it is a little on the smaller end. Sadly, it is the only size it comes in. And like all the other bags on this list, it is made out of leather. What makes this bag unique is that it is not filled with air via a plastic bladder---it is filled with injection molded foam. This is done to avoid air leaks and the hassle of bladder replacements. One last word of advice---I know that Everlast has a double end bag available for super cheap, but I don't suggest you buy it. Everlast is a ubiquitous name in cardio boxing but it tends not to make good entry-level equipment for people who are serious about combat sports. So my advice is to just skip on the Everlast bag and go with something else that might be a little more expensive but will last you much longer.